This will require a marketing budget and several other things, so if now’s not the right time, save this page as a bookmark, add it to your Pocket or do whatever you want so you can come back when the time is right! 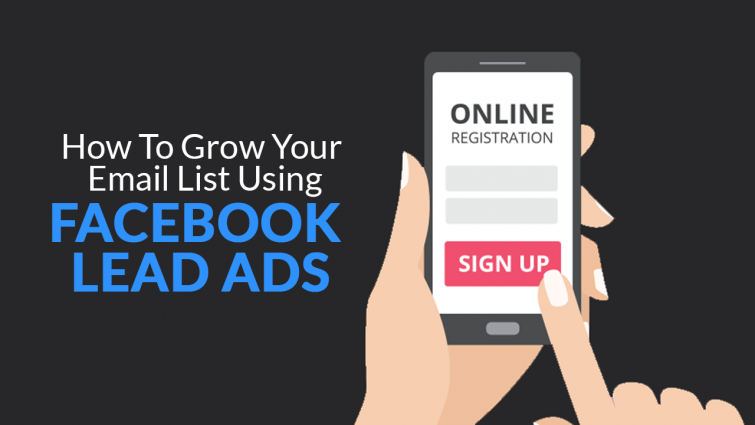 Growing your email list using Facebook is a great idea, even more so when you consider using Facebook Lead Forms. Setting this up correctly will enable you to target a specific audience with a built-in Facebook Form. Once the form has been filled, depending on your set-up you can add them automatically to your email list. We’ve done this for our email list and many assets including webinars, eBooks and more. ☑ Have a marketing budget for your Facebook ad. ☑ Have eye-catching media for the ad. ☑ Utilise a data connecting tool like Zapier for automating the process. Once you have those, you’re ready to get started. 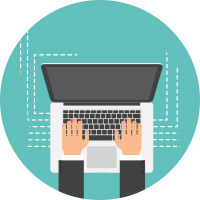 Creating a Facebook Lead Form is a very simple and fairly quick process. Just follow the steps below and you’ll have a lead form set-up very soon. Step 1: Login to Facebook and head over to the Ads Manager. Step 2: Click “Create” whilst in the Campaign section. Step 3: At this stage, you’ll need to choose the “Lead Generation” objective listed under “Consideration”. Step 4: Give your Lead Generation campaign a suitable name and then proceed. Step 5: You’ll now be in the Ad Set area where you will be required to set-up audience targeting, placements, budget and schedule etc. Begin with choosing the appropriate Facebook Page. ❗ It’s worth noting, Lead Generation forms only work on mobiles. Step 6: Once you have filled out the audience targeting, you’ll now be required to set-up the actual Ad. This is the section to create the Facebook Lead Form. Before proceeding with the form, select the format of how you would like your advert to be displayed. Upload the media and then proceed to the text section where you can include your Ad copy. Step 7: Now we’re at the Lead Form section. This is the important part. Click on the button “New Form”. Step 8: First things first, give your Form an appropriate name. Then choose the Form type. 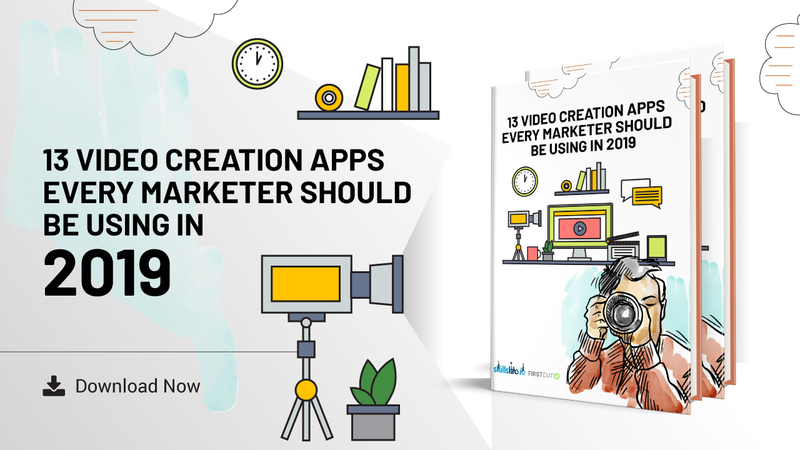 The first option will be the quickest and won’t bug your audience to confirm their information, however, don’t expect all the information to be accurate. There could be misspelt emails, names or other field answers. Step 9: Fill out the Intro section. Whilst this is optional, it’s highly recommended. We usually share with the audience what they will receive and provide some quick information. It helps build trust and makes them fully aware of what they will receive in exchange for filling out the form. Step 10: Now to the question part! This section will allow you to choose specific fields you would like your audience to fill in. When selecting these, make sure they will match up to your email marketing platform. For example, the default Facebook fields are “Full Name” and “Email Address”, for us, we’ve set up our mail sending platform having both First and Last name fields, so for it to be a smooth transition, we’d remove the Full Name field and replace with First and Last name. You can add additional questions by clicking on the “Show more options” button. This will list several more pre-created fields. In addition to the above, you can also create custom questions. In order to do so, scroll down to the “Custom questions” section. Step 12: Once you have completed the above, you’ll be required to enter information for the “Thank you” screen. You’ll need to enter a headline and a description. You then have the option to choose to send people to a website URL, download an asset or call your business. Step 13: That’s it! You’ve created your Facebook Lead Form. All you need to do now is save the form, review and confirm your advert. Facebook then review the campaign and will either approve or reject. Now, unfortunately, that’s not everything finished! – But, the next part is very quick and easy to do. So you have a Facebook Lead Form all set-up and ready to go, whether it’s live, in review or draft, that’s fine. Automating the process is fairly quick. 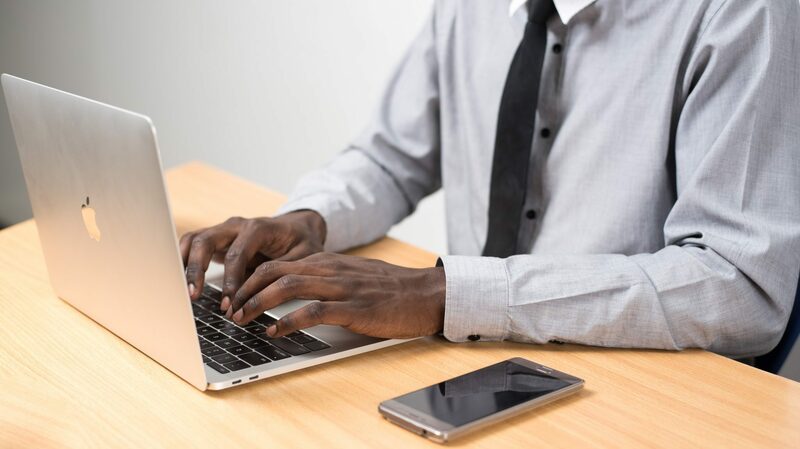 Before getting started, you must have an account with a data connector to automate workflows. For this example, I’ll be using Zappier. Step 1: Login to Zapier and then click “Create Zap”. Step 2: On this page, you will need to type in “Facebook Lead Ads” in the Trigger search box. Click “Save and Continue”. Step 3: If you have never connected a Facebook account to Zapier before, you’ll be required to do so at the next screen. 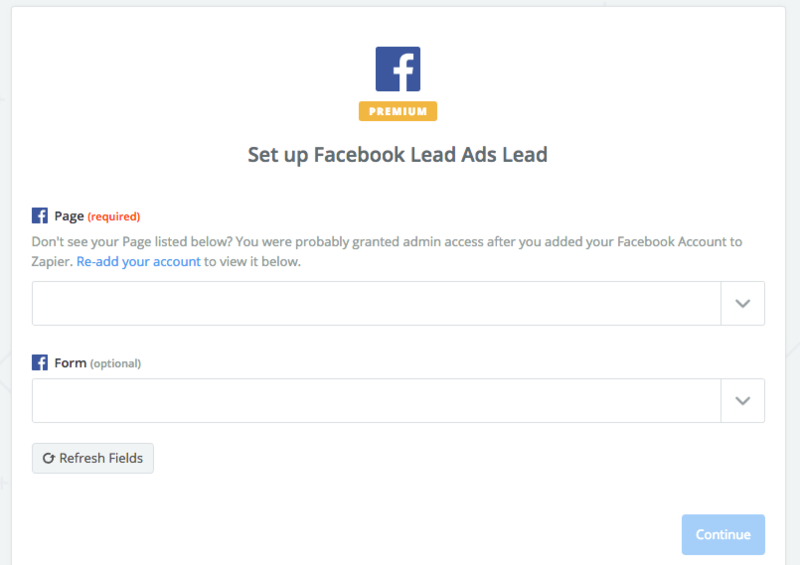 If you’ve already connected an account before, click the account you used to set-up the Facebook Lead Form and continue. 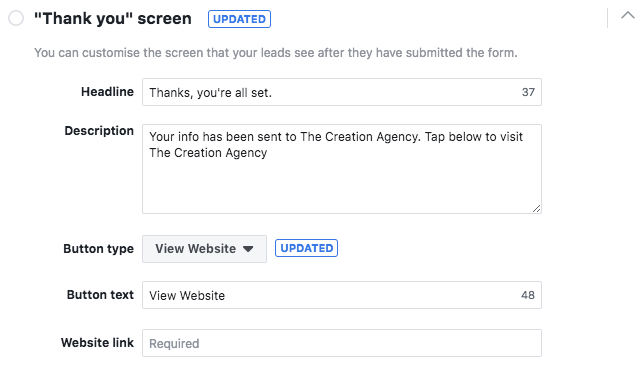 Step 4: You will now need to click the drop down and browse for the Facebook Page you have the Facebook Lead Form connected to. Afterwards, select the appropriate form. 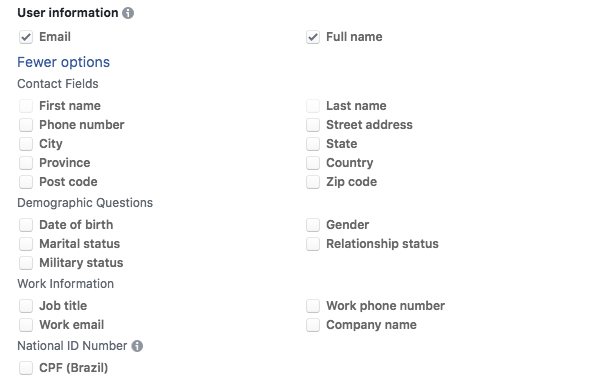 Step 5: Once you have connected and chosen the Facebook Page and Facebook Lead Gen Form, Zapier will try to pull in sample data. Once it’s pulled some data, double check everything is correct and then proceed. Step 6: So now you’ve set-up the trigger, you need to set-up the next step. This is where you connect your email marketing platform. Just like we did in Step 2, search for your platform. For this example, I’ll be using Act-On. Choose the appropriate option and then continue. Step 8: The next stage, you’ll need to connect your Zapier account with your email marketing platform. Once connected, click the account and proceed. Step 9: You’ll now be given the option to choose a specific list. Step 10: At this stage, you’ll now need to match up the fields from the Facebook Lead Gen Form to your email list fields. Step 11: Test the form connection. Once you’re happy with everything and it’s all working well, you’re pretty much done! Just go ahead save it and give the automation workflow a name. As you’ve set-up a Facebook Ad, insights will be available for the campaign. 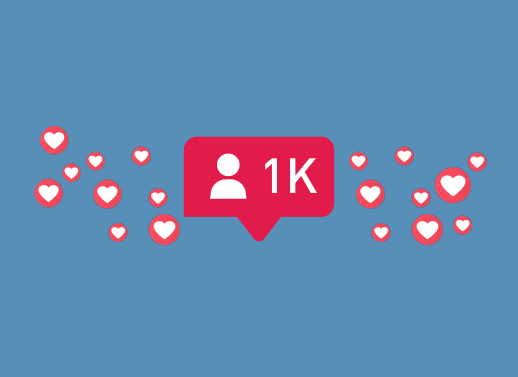 You’ll be able to track how much each lead costs, how many impressions, engagements and so much more. This can be monitored through the Facebook Ad Manager. I would recommend keeping an eye on the results and the cost per lead. It’s good practice to run a few variations of the ads to see what performs best. We’ve used Facebook Lead Ads for various assets including webinars, eBooks and even for our newsletter. They’ve all done fairly well. However, we wouldn’t just recommend sticking with lead ads, you should also experiment with other Facebook Ad types. Whilst using Facebook Lead Ads connected to your email marketing platform is very effective, there are many other workflows you can set-up whilst still utilising the Facebook Lead Ads objective. We’ve shared the best ones below. 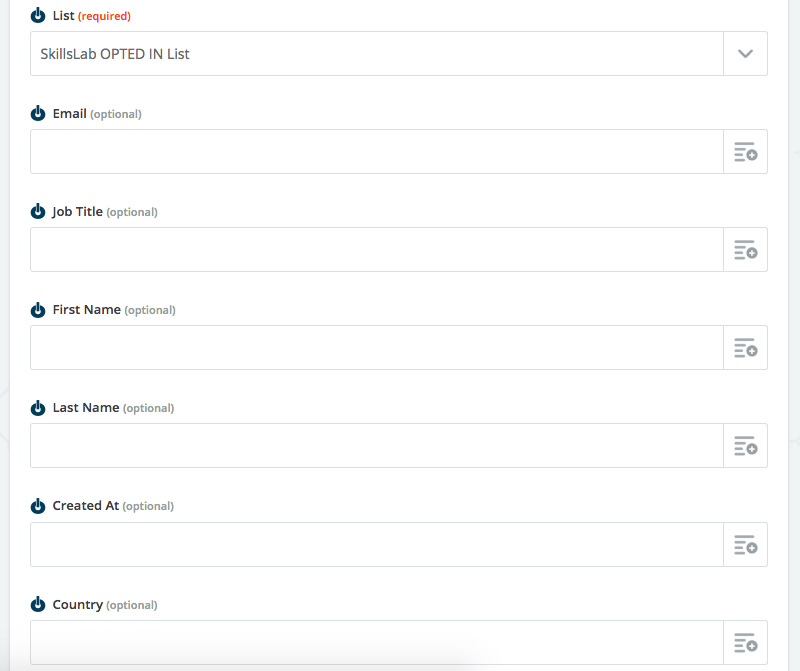 Using Zapier, it’s possible to set-up an automated workflow where once a Facebook Lead Ads form has been filled out, you can send it to Hubspot as a form submission. Facebook Lead Ads can also be used with Gmail setting up an automated workflow. The triggers can be any of the following when a new Facebook Lead Form is submitted. This would be a good process to set-up a notification email to the appropriate person for when someone has filled out a Facebook Lead Ad Form. 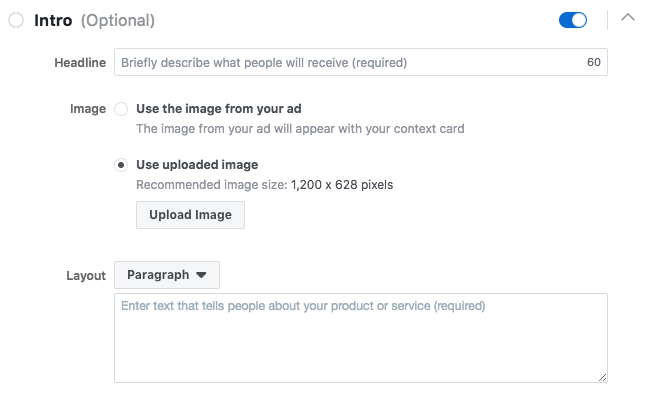 For those who love to use Slack (like we do ❤), it is indeed possible to set-up an automated process with Facebook Lead Ads. You can set-up a workflow where once a form has been filled out, you’ll receive a notification on Slack. This is very effective, especially when it’s sent to a channel on Slack. 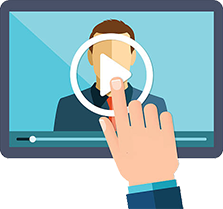 We’ve got various notifications set-up for example when someone registers for our webinars, downloads an eBook etc. They’re very handy! Utilising Facebook Lead Ads to grow your email list is a very effective strategy and we’ve had great success with it. However, you shouldn’t just rely on this campaign objective, don’t be afraid to experiment with ad types. If you’ve set-up the automated process, we’d love to know how it’s working for you. Share with us in the comments below!